World renowned psychologist, astrologer, palm reader, and clairvoyant Ralph Wagner, is shown in the photograph above being congratulated by his brother after purchasing a sporty new Chandler Royal eight roadster. Mr. Wagner boasts an impressive roster of achievements as a psychic. He foretold the World War back in 1908, and he predicted the recent Weepah gold strike in October of 1926. During the past five years more than 54,000 Angelenos have consulted the palm reader for advice! Poor Ralph – bad vibes must have jammed his psychic radar…or maybe the stars were out of alignment. By 1929, parts for his snazzy roadster would be difficult to find. 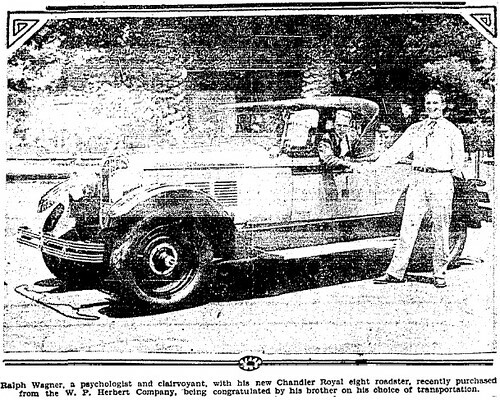 Chandler’s best year was 1927 when they sold over 20,000 cars – one of them to our psychic friend. Anticipating continued stellar sales, the car maker expanded too quickly and by the end of 1928 they were over $500,000 ($5,987,126.44 USD 2007) in debt. Chandler was purchased by Hupp Motor Company in 1929 and vanished from the planet. Will someone please check on the rock of Gibraltar, and give us a call?